Marin Software, a leading provider of digital marketing software for performance-driven advertisers and agencies, released research findings from its global Q3 2018 Digital Advertising Benchmark Report. While search spend increased globally, growth was lower in Europe. Separately, Instagram revealed itself as an up-and-coming target for advertising dollars, with Instagram Stories being a preferred ad format. European Paid Search Slows Down: Anomalous to increased global search spend, eurozone growth was relatively meagre at 5.7% YoY in Q3 2018. Europe also saw lower CPCs than the global average, with a $0.44 CPC in Q3 2018 compared to the global average of $0.83. With the General Data Protection Regulation (GDPR) wrapping up its first full quarter, lingering privacy concerns may be taking a toll on the European search advertising market. “Instagram’s boom was one exciting area of digital advertising growth we witnessed this quarter. This year alone, Instagram jumped from five to 15 percent of our customers’ Facebook spend,” said Wesley MacLaggan, SVP of Marketing at Marin Software. 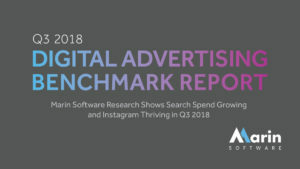 To create its Q3 2018 Digital Advertising Benchmark Report, Marin Software aggregated data from customers who invest billions of dollars in combined annualised ad spend on paid search, social, mobile, and eCommerce. Marin Software only includes those advertisers active on its platform for the past five quarters, measuring key performance indicators on a year-over-year and quarter-over-quarter basis, and removing any outliers with significant YoY or QoQ changes.